Best practices in programming are codified in a wide range of patterns. In this issue, we look at some of those patterns to help make sure that established knowledge and techniques find their way into code. We start off with a deep dive into one of the traditional design patterns, Command, and see it applied in multiple contexts: contacting remote systems and executing code there, and building an interactive editor. We then look at recommended patterns for JPA and Hibernate and how to solve problems that come up in the persistence layer, after which we explore the producer-consumer pattern in contexts of high-volume, spiky data when it needs to be rendered in JavaFX. 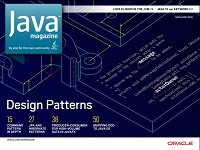 The final design-pattern article addresses mapping concepts of domain-driven design (DDD) to Java EE. DDD contains its own set of patterns that attempt to map domain knowledge to an implementable system. It lifts software architecture directly into the problem domain, enabling experts there to participate more effectively. How those concepts are mapped to Java EE can be tricky to know at times. This article helps illustrate that mapping. Java 10’s new var keyword is a bit of a puzzle to some readers, and our detailed treatment of how and when to use it illustrates making best use of this handy feature, which we expect will be widely adopted over the next few years. And if you’re a glutton for deep understanding of the JVM’s inner workings, don’t miss our article on how the compiler and JVM identify redundant locks and remove them from code. This feature might seem rather obscure, but it accounts for the difference in performance between StringBuilder and StringBuffer and also explains why arrays of more than 64 elements have a different performance profile than smaller arrays. In addition, you’ll find our usual in-depth quiz, as well as my book review of a volume that’s useful when doing code reviews and answering a colleague’s questions about why a given Java routine needs to be rewritten. What Java tools are developers using? Find out by filling out our survey. This is a biannual survey of thousands of developers, which we are running jointly with Snyk. We’ll publish the findings, so you can see what tools your colleagues at other organizations are using. It is one of the largest surveys of Java developers, so we hope you’ll help us deliver the best data by doing your part.